Heat oven to 350°F (325°F for dark or nonstick pans). Place paper baking cup in each of 24 regular-size muffin cups. Make and bake cake mix as directed on box for 24 cupcakes. Cool in pans 10 minutes; remove from pans to cooling rack. Cool completely, about 30 minutes. Remove paper baking cups. Place 2 cupcakes upside down on separate plates. Cut small piece off side of a third cupcake to make a flat surface. Cut third cupcake horizontally in half. Place one half with cut side against cupcake on plate as shown in diagram. Place other half against second cupcake. Repeat with remaining cupcakes. Frost cupcake booties, attaching toe piece to cupcake with frosting. Decorate booties with marshmallows and bow shapes cut from gumdrops rolled with a rolling pin. Store loosely covered. 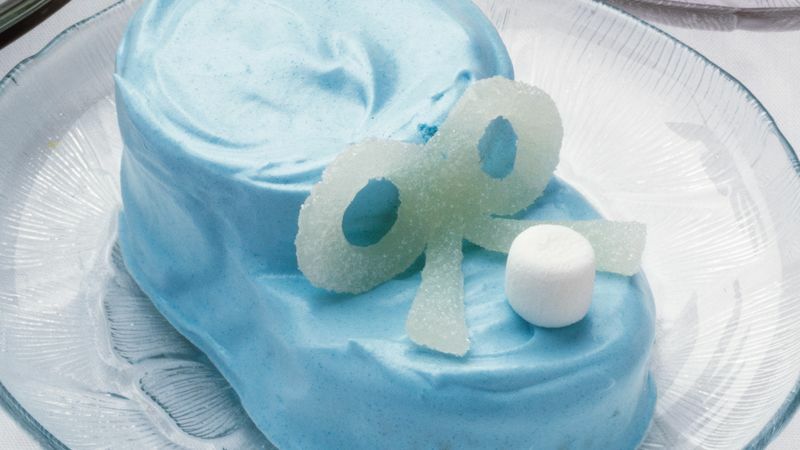 Create bootie colors of your choice by stirring drops of food color into frosting.